Here’s what happens when you finish a large project, and have some extra time. Tangents. Also, its all related to an upcoming trip, and I MUST HAVE THE PERFECT TRAVEL PROJECT for any trip. Even if the whole point of the trip is for rug hooking and getting started on a new rug hooking project that I am very excited about. I need something for my evenings. Something new and fun. So, I noticed with my “stupid sewing” project that I really loved the colors of thread that I had picked out. Only with the darker background of this project, these colors didn’t show up quite as well. Maybe I would choose a neutral background and use just these threads to do some kind of stitching. Much doodling sketching ensued. I came up with this partial design while sitting in church Sunday and decided to go with it. 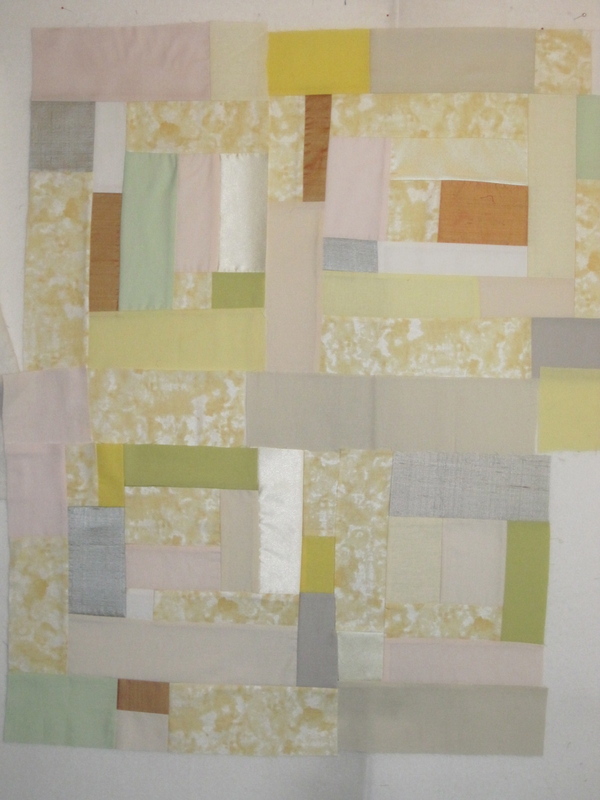 A quilt sandwich has been made, and I am doing some experimental stitching on it. While cleaning out my fabric bins, I came across a collection of fat quarters that I had gotten a bit ago that I was very enamored of, and had not yet had time to play with. Maybe I’d take them and do some hand piecing on my trip. I decided to try this out. Did I even still like hand piecing? To be honest, I started on the machine. Then I decided that these little fiddly pieces would probably be easier to hand piece. As of today, I am undecided about which project I will take with me. I did remember that I had another travel project from my Colorado trip, so I will bring that for sure. 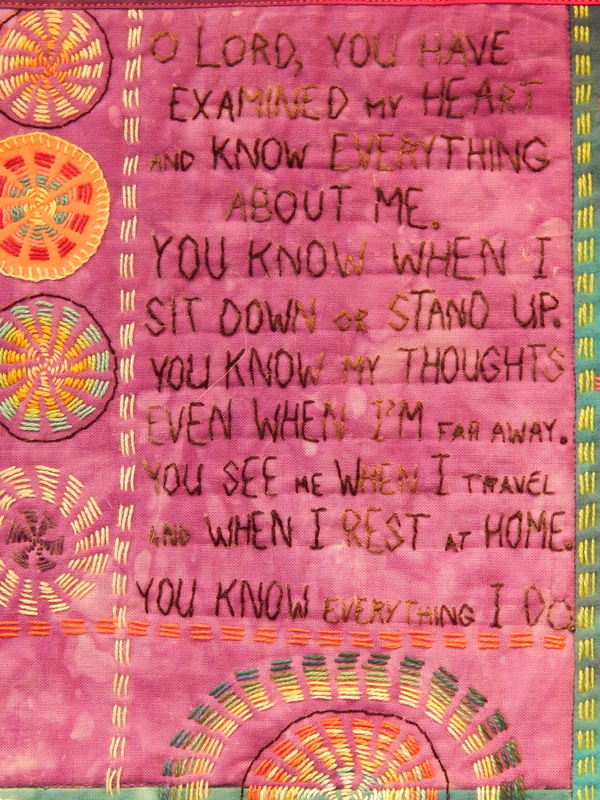 I am leaving a little early for my rug hooking retreat so that I can visit the Road to California show! I will return with lots of new ideas, I am sure. I just returned from a week-long trip to the little town of La Veta, Colorado! My BF decided that she wanted to take an intensive workshop with Judith Baker Montano, and I said, “want some company?” I have done “self-retreats” before, and find it very profitable to spend concentrated time working on projects at a location other than my studio. Plus, Colorado? That sounded fun! We found a great place to rent, with plenty of room to spread out all our quilting supplies. In between visits and “touristing” I managed to get quite a few bits and pieces done. 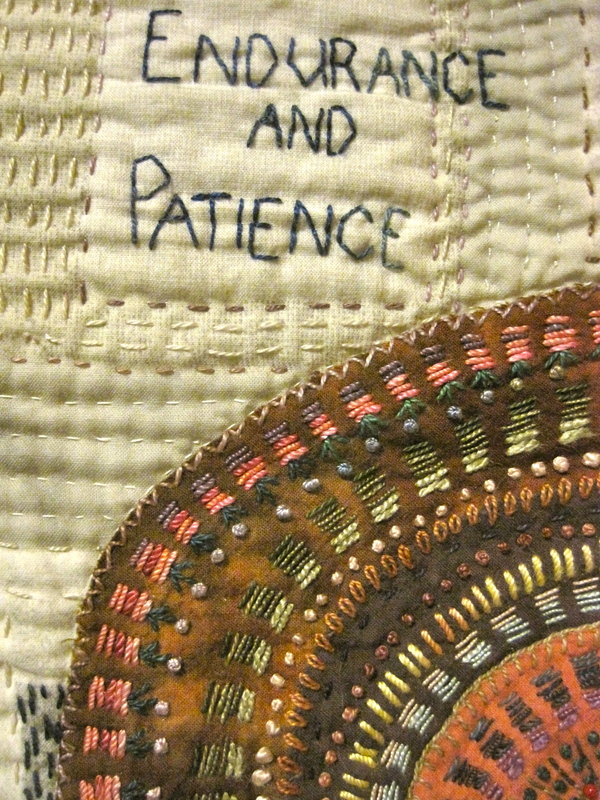 I admire piecers who work with small bits so very much. One of my current favorites is Maria Shell–check out her work in this blog post! So the first thing I wanted to do was to do some piecing with my bags of Cherrywood fabric. I also had a scrap of Ricky Tims’ multi-color fabric, and I decided that I would cut the center squares out of that, and then use the cherrywood bits to make some abstract log cabin blocks. Nothing was cut straight, but as I finished each piece, I squared it up to 4 1/2 inches. At the end I made three 6 1/2 inch blocks. Now, although I admire the work of others who work with small bits, this is about my limit. I get bored. So I will sit and think, and eventually these pieces will work their way into one or more projects. I did this a couple of years ago, and I used all those little blocks to make the “what they said” series, as well as several other pieces. Next, that big blank canvas for embroidering on. I also admire the work of Judy Martin, Penny Berens, and others who work on daily “scratchings.” Once again, I don’t think I really want to spend the time doing this EVERY DAY. But I love the idea of it. 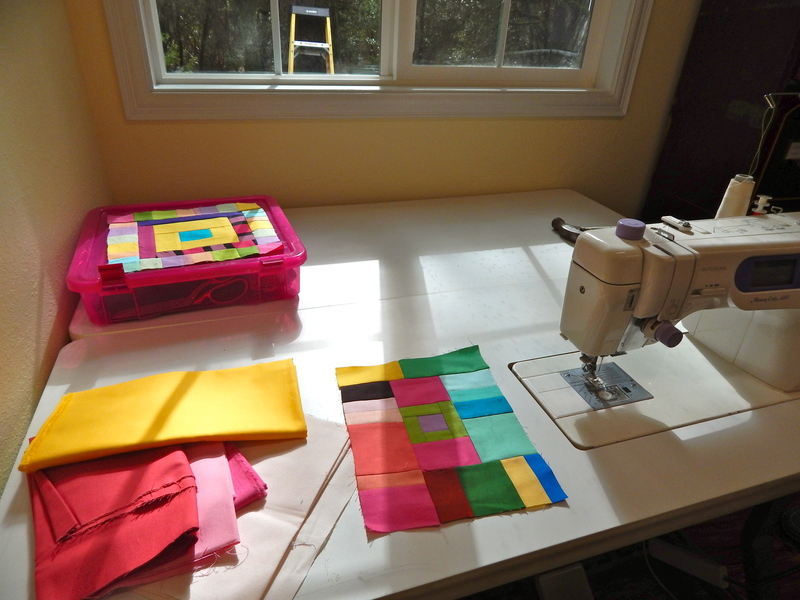 So that was in my mind when I took this big (for me) blank quilt sandwich to embroider on. The first day I took it out and stared at that big empty space, it started to rain. Evidently, this is “monsoon season” in Colorado, and the afternoon rains are very welcome. They don’t last long, and they cool things down nicely. So I embroidered that. Ricky and Justin took Robin and I out to their property (45 minutes from town!) and on the way there was an old church, the last remaining building of what had once been a small town. I was fascinated by it, and took several pictures of it. I decided that I wanted to try embroidering it. You can see with both of these that I started by cutting out simple shapes and using blanket stitch to embroider them to the blank. Hand dyes work very well for this–practically no raveling at all. 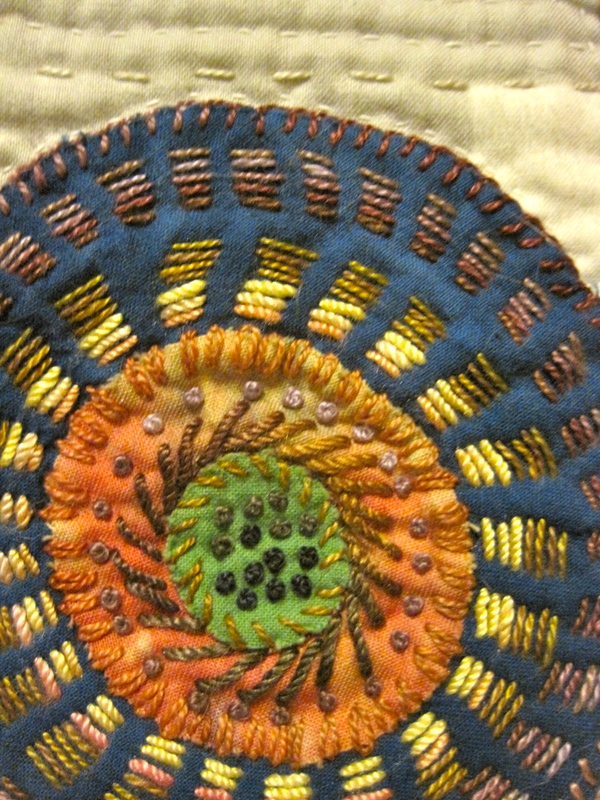 I really enjoyed the “grass” stitching. Very quick and simple. I hope to do more of this. 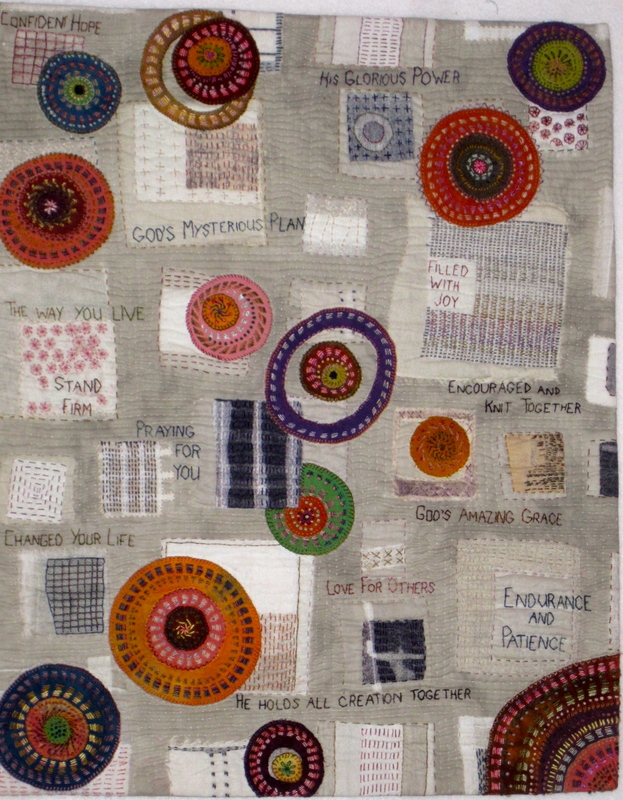 So these embroideries were a little departure from most of my work–more representational than abstract. I enjoyed doing them, and I wonder what it will lead to. Right now I think I will keep this blank as a true travel project, and will take it with me on my travels, and add a bit to it with each new location. The last day I got out those squares of hand-dyes that I had carefully packed. I spent a lot of time staring at my journal, making notes and thinking, and finally started two of the squares. 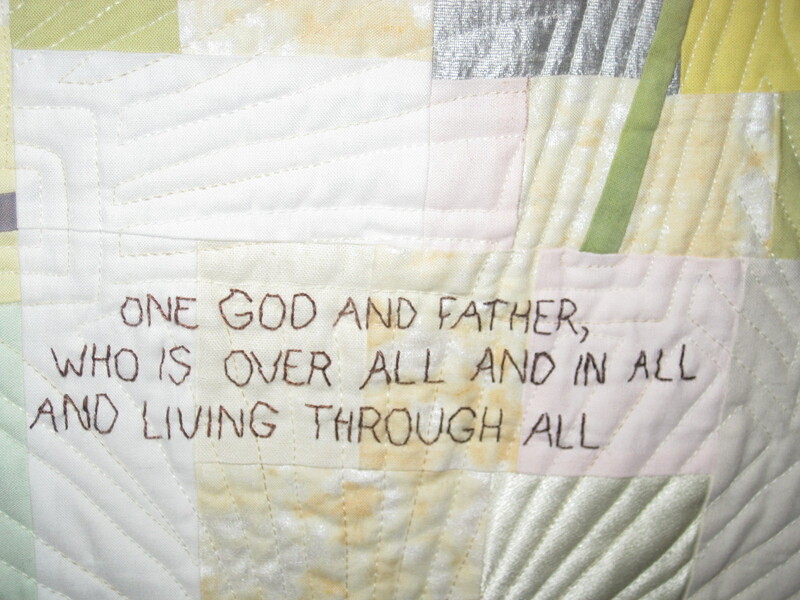 They are for a quilt of Genesis. My brother suggested it, and I think it will be a very interesting project. 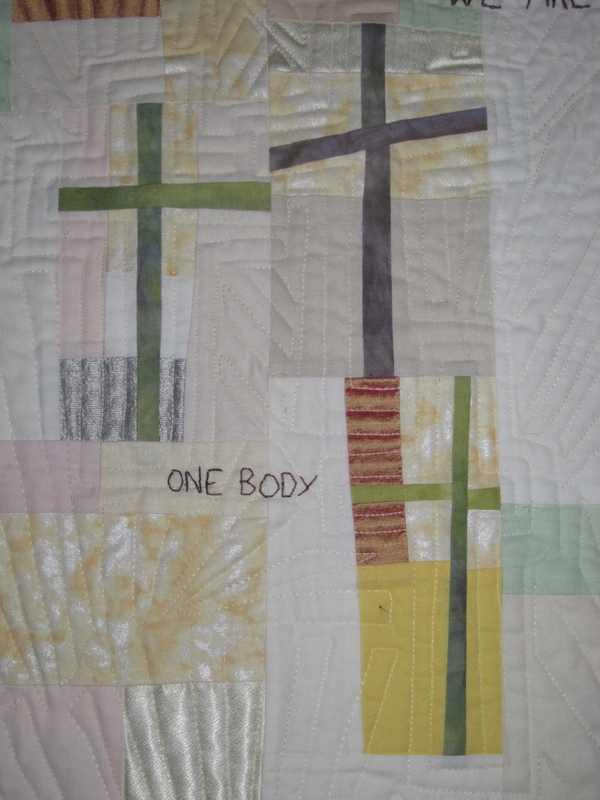 Of course, some of the blocks will be on creation, but there are other interesting stories in Genesis that I am challenged to try to represent in cloth. 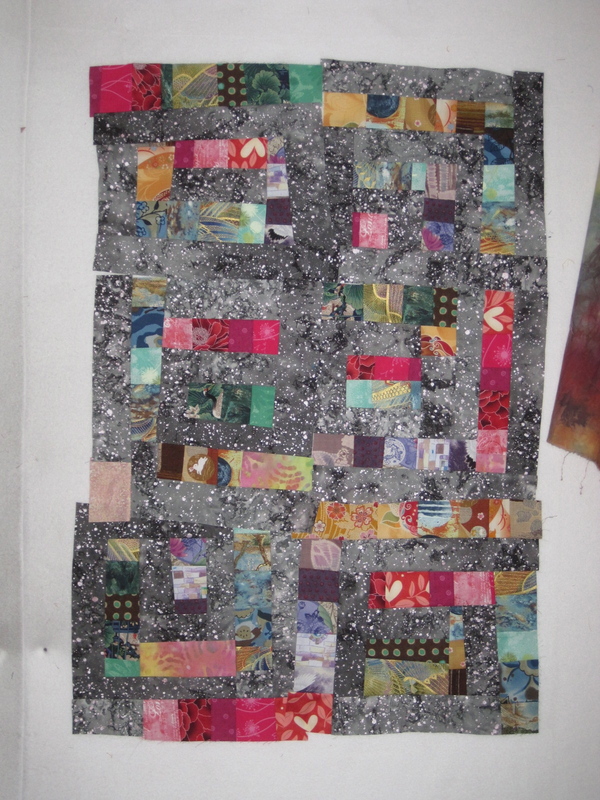 And now home, and I reverted right back to working on my Hallelujah Chorus quilt. I have three word panels done, and one and a half circle panels. 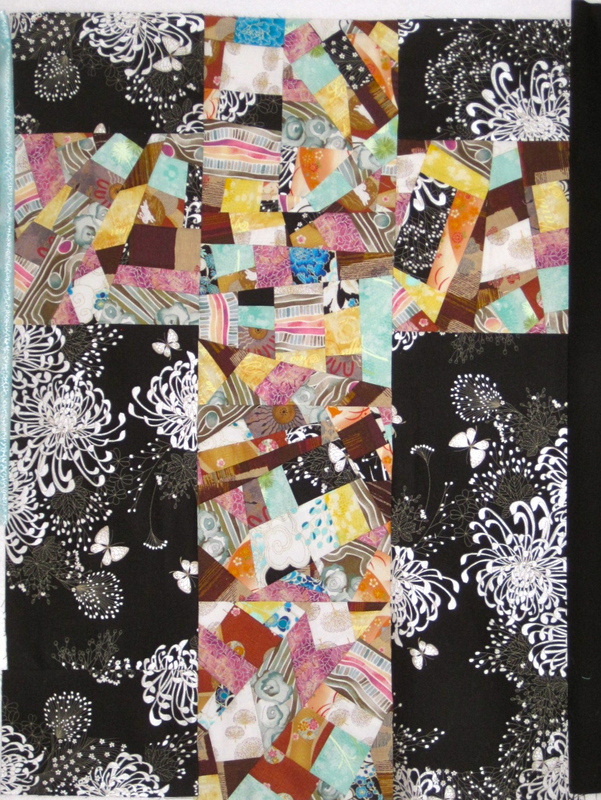 I am motivated to work consistently on this quilt. Not only is it enjoyable to work on, I would like to finish it by November for several different display possibilities. Usually I only show you pictures of the studio after I’ve cleaned it up a bit. Right now I’m in the middle of SO. MUCH. FUN. and creativity, I don’t want to stop to clean. 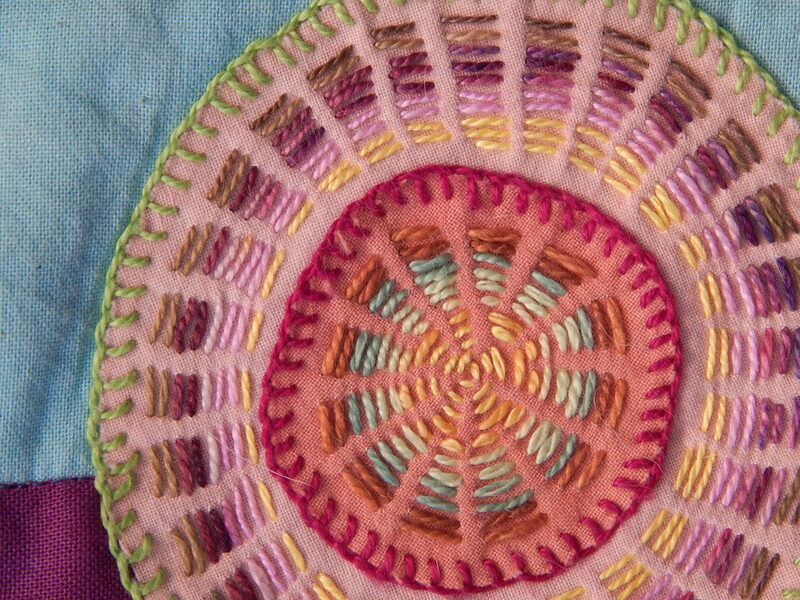 In between the rug hooking frenzy, I’ve allowed myself to play with a box of leftover pre-cut fabric strips. I’m enjoying this project quite a bit. Its tempting to add more fabrics in, but I’m making myself stick with the strips that are already cut in that box. The only fabric I added is that blue and green print. I think it adds a lot of focus to the piece. And, at the other end of the room–rug hooking central! Oh, and you can see in this picture that I got a large cutting mat that I cut to fit the entire desk top! Super good purchase–got it at Joann’s with a 60% off coupon! Before now, I’ve only worked with a 15X20 cutting mat! 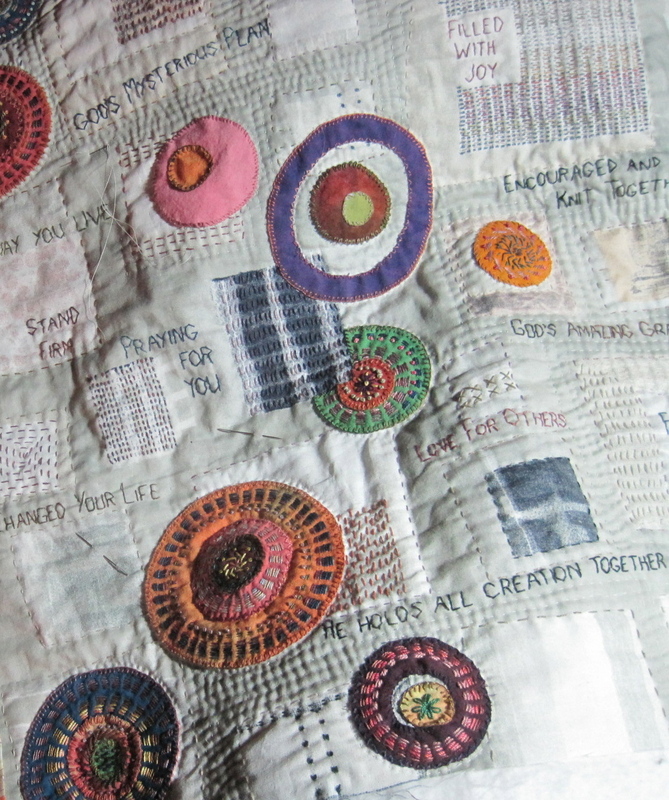 I am so enjoying working on this big rug. Its hard to stop! Close-ups. I added white “coral” on one side, and coral colored coral on the other side. 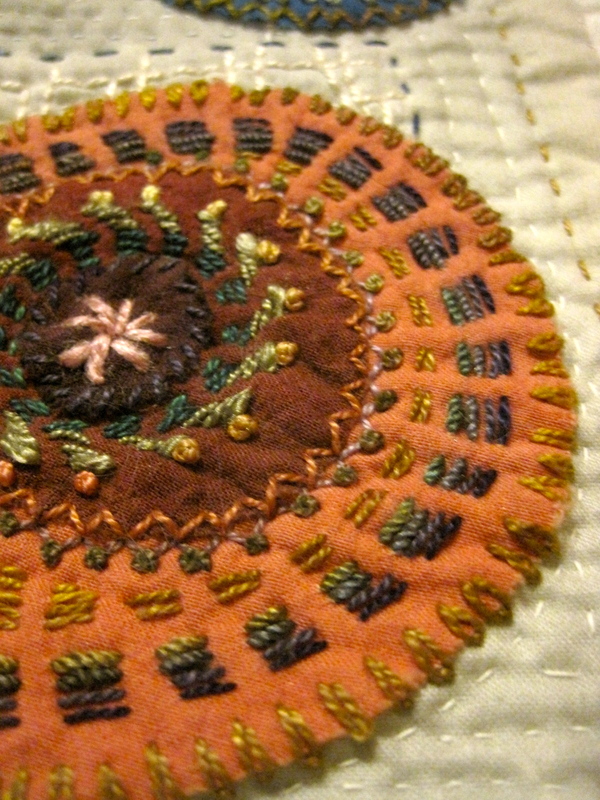 I took a break from quilting to concentrate on the rug hooking, but of course, I never completely stop stitching! These are two “travel projects. I started this one when I went to PIQF last October. Just an excuse for obsessive stitching. And as you can see, its not finished yet. 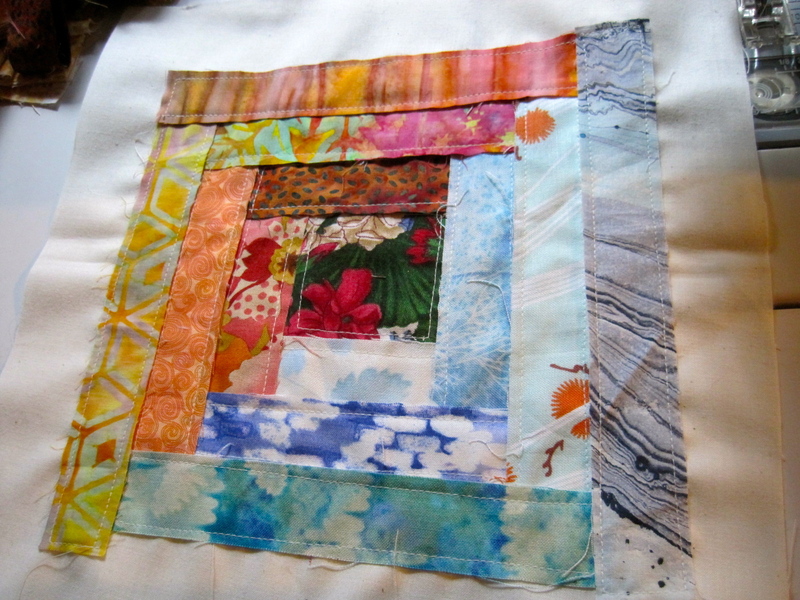 I’m trying to think of some creative way to finish off all those bendy borders. 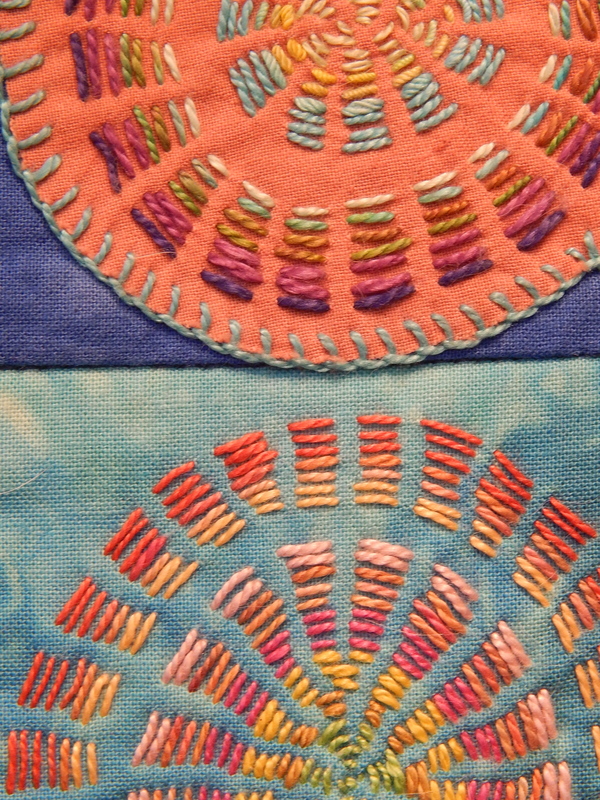 Close-ups: I had a little french knot obsession going on! This next was my travel project for the recent rug hooking trip to Anaheim. I hook all day at these retreats, and I like to have a project to hand stitch on in the evening in my hotel room. I saw something that made me think of making circles that weren’t circles, and that appealed to me. I didn’t have anything in mind except adding one big off-center circle. Then I took some of the leftover pieces and added them on to one side. And then I thought, well, it would be more balanced if there was a third element added. By then I realized that it was starting to look like tide pools. 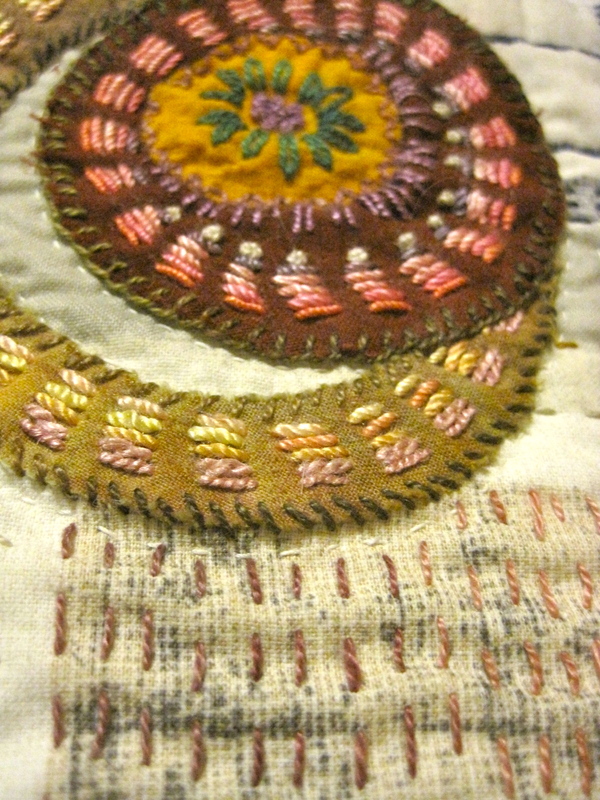 I stitched obsessively on the motifs. But before I was very far, I knew I wanted to experiment with adding a second layer of stitching to indicate water ripples. And then I thought about adding “barnacles” using yo yos. Now it has a dimensional element, so I am feeling like I need to add another dimensional element. NOT an octopus 🙂 Maybe a starfish. And a lot of beading. But before I can do any beading, I will have to clean my studio. So for now, it will stay on the design wall awaiting inspiration. At the end of my Sisters trip, I pieced this together. 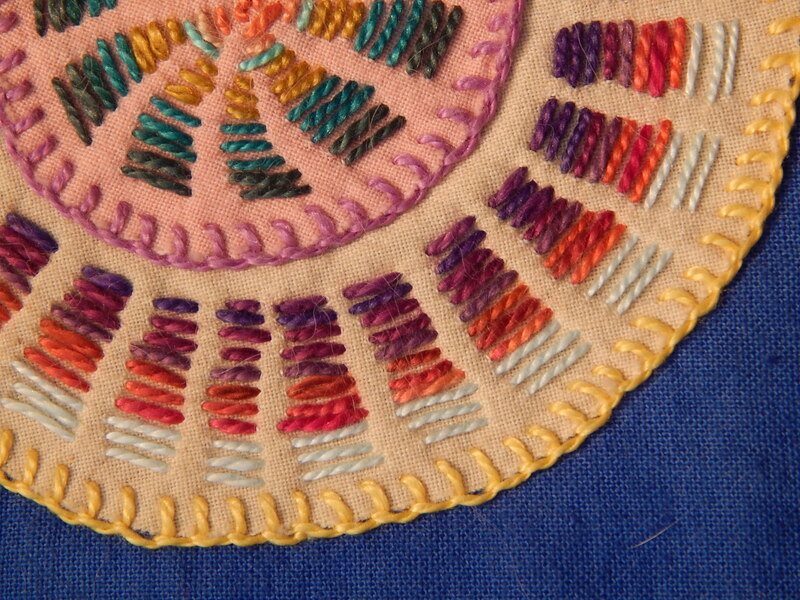 I simply wanted a background of my hand-dyed fabric to embroider on. I wanted to see how it was to stitch through. (My hand-dyes so far are muslin and Robert Kaufman’s Kona PFD fabric.) I just intended to do some straight line stitching on it. Then it just seemed like it needed some circles. 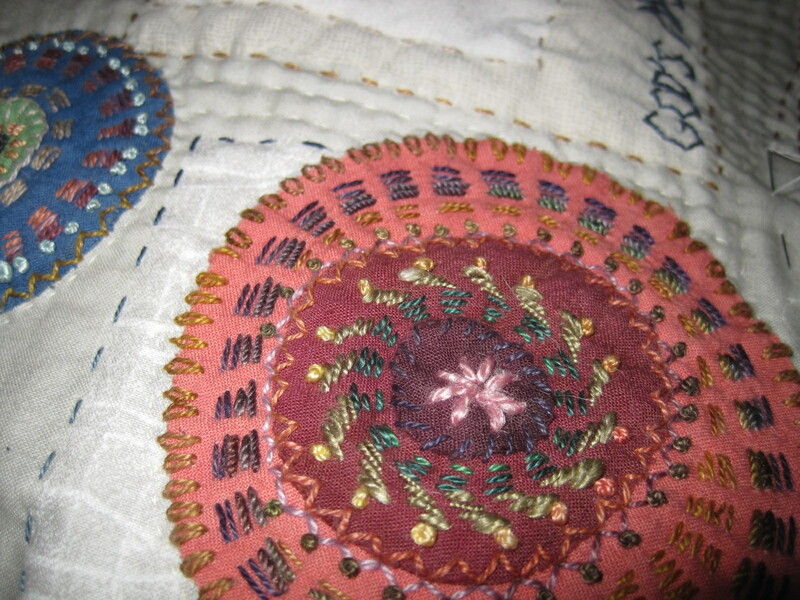 Some of the circles are stitched straight on the fabric, while others have a solid appliqué background. 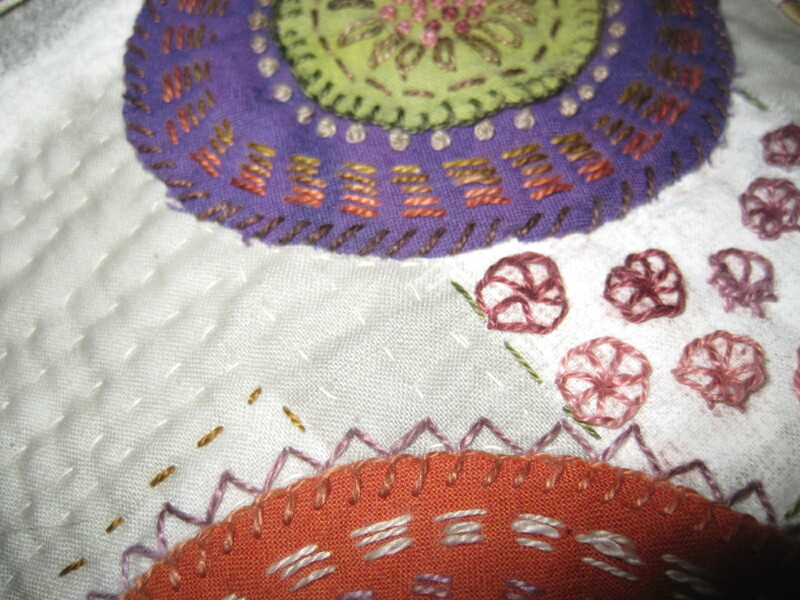 BTW, my hand-dyes are LOVELY to stitch through. Not hard to figure out, since both of those fabrics are not tightly woven. I put a question mark after “Finished?” in the title, because I think this little piece might need a bit more quilting in the background. 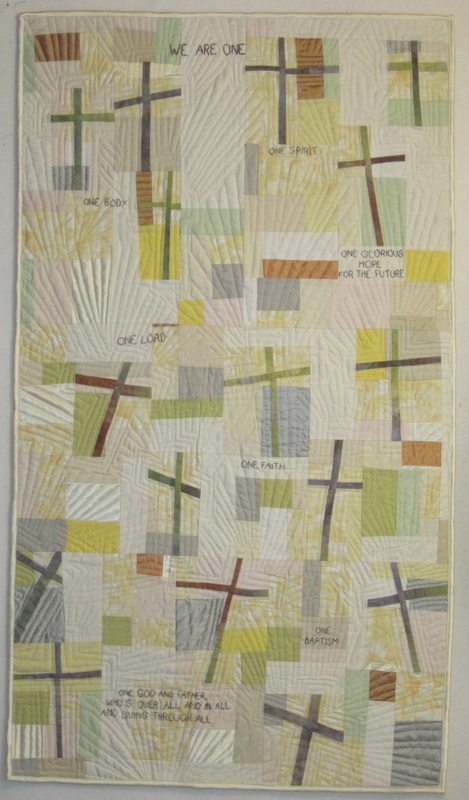 Here is one more look at a quilt I think I already shared with you. It is bound now, and it really is finished. Haha. The title is much more dramatic than the mundane reality of moving an entire studio from one location to another. The new studio is finished, and furniture is moved in. Some of the fabric has been brought in, but none of it is in exactly the right place. Anyway, last weekend I took a couple of days off, just to get out of the house and the endless construction, and went to a hotel for a little personal quilt retreat. I found my box of good scraps under my bed, and chose some fabrics I liked, and then found a piece of “fabric I love” and grabbed that to go along with. 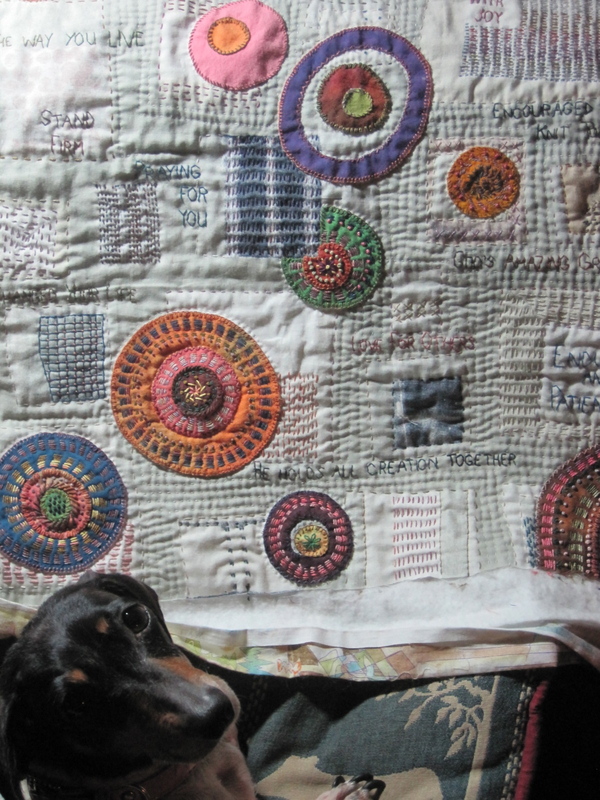 I looked through my Gees Bend book for inspiration, and found one of the housetop quilts that I thought would be fun and easy to construct. I managed to make 9 blocks while I was gone, and finished the other seven after I got home. 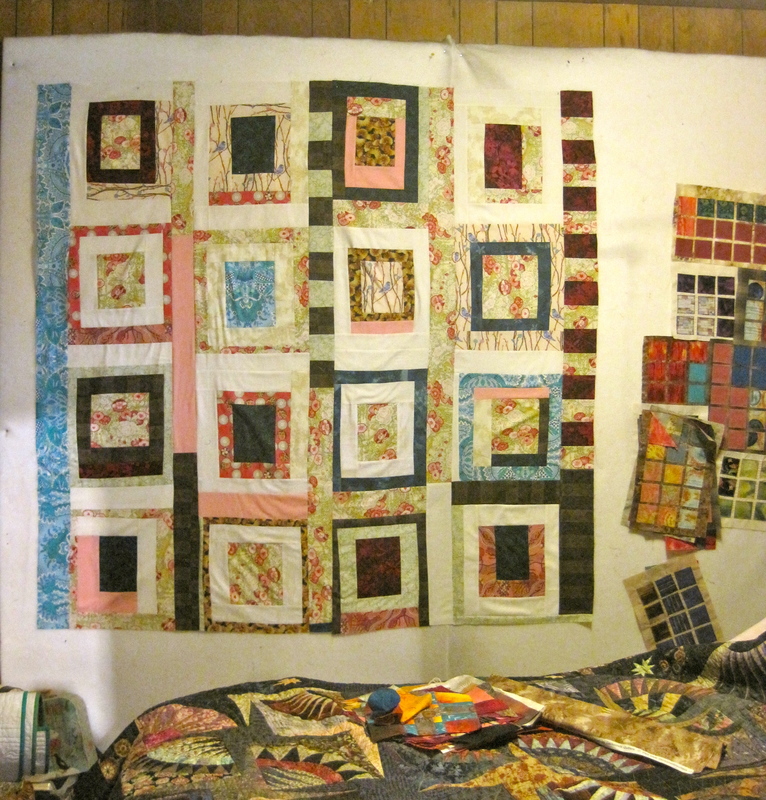 So this is the very last quilt to be on my design wall in my bedroom. Its nothing spectacular, but it was fun to play with those fabrics I like, and very relaxing. It doesn’t look finished to me. I might add another row to it, or embellish it a bit. You can probably see that its not very straight. That’s what happens sometimes when you work improvisationally and quickly. But its cloth, and it’ll all come out fine in the wash. Literally haha. When I got home from that trip, the studio was completely finished! I posted a lot of pictures on my other blog . 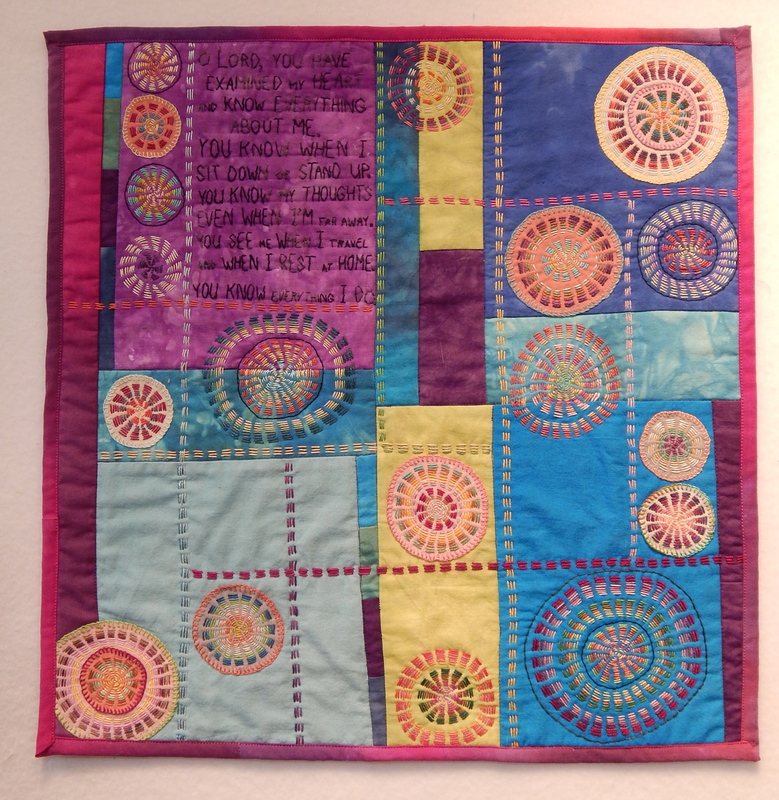 In case you only read my quilt blog, you can click here to see those pictures. 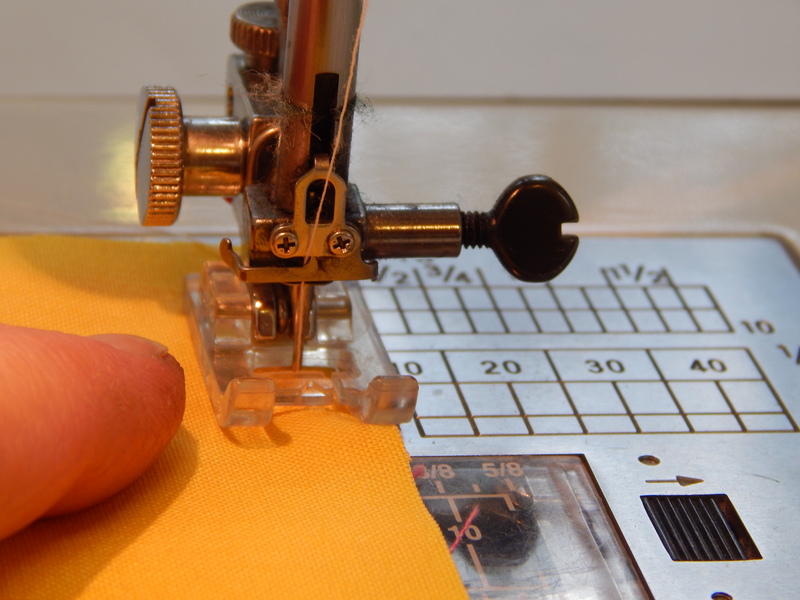 And here is the very first stitch I am taking on my sewing machine in my new studio. How fun. I was just putting some borders on an orphan block to take with me as my travel quilt for this next trip. I am headed to Haiti and to Texas! I can hardly wait to get home and really get my studio set up the way I want it to be. The little travel quilt is completely finished. Once I finished it and washed it I was very pleased with how it turned out. Even though I don’t have that much time to work on these quilts while I am actually traveling, they hold a lot of memories for me. And now I have no little circles to work on at night! I am getting a lot of knitting done. 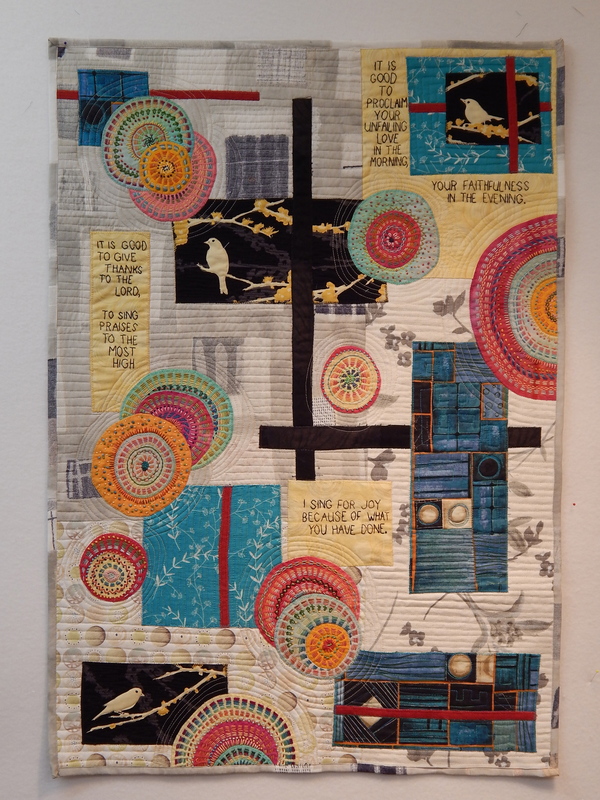 But I am hankering for another hand stitching project, so hopefully I will come up with one soon!